Nearly 200 residents attended the City Council's special session on Monday. 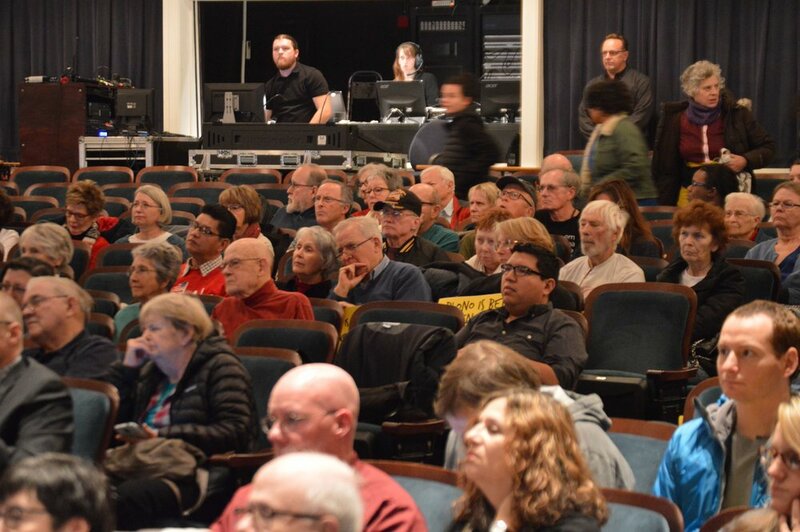 Approximately 200 residents gathered at the Bloomington Center for Performing Arts on Monday to share opinions on the Welcoming City Ordinance. Bloomington Police Chief Brendan Heffner gave his official position against the ordinance after a search of BPD records revealed no instances of the city's assistance with any deportations. The search included records dated as far back as 2002. Both Chief Heffner and legal counsel Jeff Jergens expressed concerns with the language of Section 4 of the ordinance, which may tie the hands of local law enforcement in cases where collaboration with US Immigration and Customs Enforcement (ICE) is essential, such as human trafficking. Chief Heffner also cited that BPD is already in compliance with the Illinois TRUST Act, a bill that prevents individuals from being detained solely on the basis of immigration status. Of 21 public commenters, six spoke out against the ordinance, including Robert Workman who said, "Elected officials should not be involved in circumventing the laws of our nation." Another resident, Gary Lambert, stated, "We are a nation of immigrants, yes, but we are also a nation of laws and we must do more to stop [illegal immigration]." Supporters of the ordinance included Don Carlson, Executive Director of Illinois People's Action, as well as representatives from the YWCA Stepping Stones program, Not in Our Town, The Immigration Project, and the League of Women Voters. Supporters believe a welcoming city ordinance will improve safety for immigrants by allowing them to report crimes without the fear of deportation. The added protection for victims of crimes is not covered by the Illinois TRUST Act. The Bloomington City Council moved to revisit this discussion in January.